In Hildesheim, about 250 Km from the capital Berlin, the first national base under the Renovação Fight Team (RFT) flag in Europe was open. This was reported this week by the headquarter of "RFT Brasil", in Rio de Janeiro, in an official announcement. The event was celebrated by members from Brazil and Germany and at the next possible opportunity the academies and athletes will carry out the formal exchange. 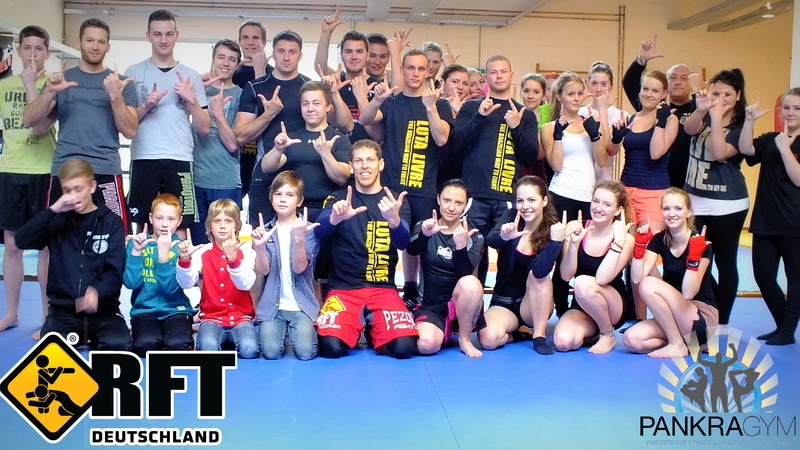 The new "RFT Deutschland" (RFT Alemanha) already has 30 athletes in the Luta Livre and MMA training group. The training of the main disciplines of Renovação Fight Team take place on Mondays, Wednesdays, Thursdays and Fridays. In addition, as an extended benefit, members receive complementary access to the available fitness, health and wellness services of Pankra Gym. Pankra Gym, a highly respected institute, is where "RFT Deutschland" delivers it’s programs. Another training program acheiving great success in our academies is "Cardio MMA", which has now reached German territory for the first time. Coordinator and National Coach of the "RFT Deutschland", Nico Welko, welcomed the new event and commented his confidence: "It is a great honor and we will not disappoint. We will work hard to continually lift up the RFT in this country as well" (Original: "É uma honra muito grande e não vamos decepcionar. Vamos trabalhar muito para a RFT crescer ainda mais no país”). The first challenge for the team already has a date: This coming May 24th, the German edition of the NAGA GRAPPLING CHAMPIONSHIP will be held. "RFT Deutschland" has set up a team of eight athletes for this event. "RFT Alemanha" is the third new RFT Academy established in 2014. This European expansion is a continuation of the developments in the Brazilian cities of Campo Grande and Cuiba, with each of them opening their second Academies in the first quarter of this year. Since 2000, the RFT has also been represented by the team Kaobon in Liverpool, with whom Luta Livre has been introduced to the United Kingdom. As strong representatives, the cooperation and exchanges between coaches and athletes is set to continue well into the future. RFT also has a total of 11 other Academies in Brasil and the USA.